All things tallied, 2011 has been a very kind year to me as far as tattooing is concerned. This year saw the creation of OV, which has helped me be more proactive about archiving classic tattoo videos as well as being able to spotlight tattooers that I respect and hopefully encourage other people to check out their work. It’s also seen me getting tattooed more in one year than I have in the last few years combined. 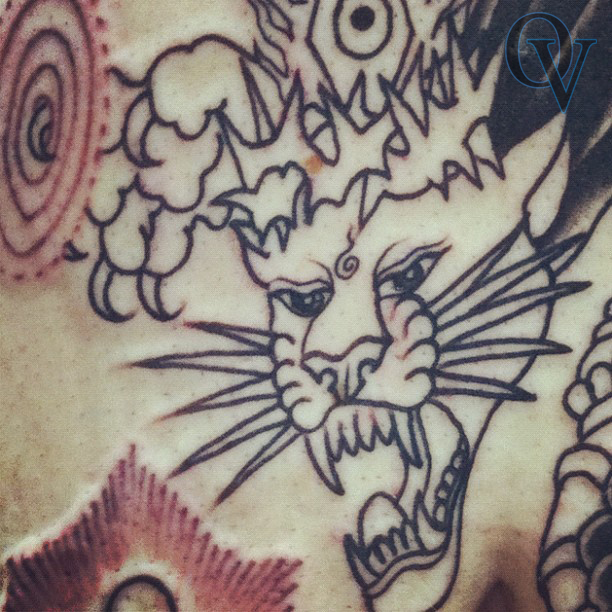 With a few weeks left in 2011, I’m healing up a new piece by the always impressive Chad Koeplinger. It’s just under a week old and it’s on it’s way to settling down. I’ve been dreading the stomach; horror stories abound when it comes to stomach tattoos, from people who’re considerable more covered than I am. I went to Tattoo Paradise in D.C. prepared for the worst, calmly accepting that I was going to be in agony and that’s just how it was. Luckily that wasn’t the case at all. This was my first time getting tattooed by Chad and it was a breeze. It hurt; of course. It’s a tattoo and all tattoos hurt. But it wasn’t agony. Conversation flowed fairly solidly, and before I knew it we were done with session one. I couldn’t have asked for a more efficient and enjoyable afternoon. Chad’s a well traveled dude and that comes with amazing anecdotes that really take your mind off the tattoo. If he comes to your neck of the woods, and there’s a pretty decent chance that he will; book some time. You’ll end up with a damn nice tattoo. This is a little snippet of my stomach tattoo; It’s the incarnation of Christ/Krishna with Vishnu’s Panchajanya. There’s a lot going on in the design that’s not really apparent, but we put a lot of thought into it and I’m lucky to have Chad interpret my more abstract needs and turn it into something honest and awesome.